The Institute of Brewing and Distilling seems to be focussed a lot more on the former, at least dahn sarf, so I was looking forward to the meeting at Bombay Sapphire distillery. Sadly the Master Distiller had been called away so we got the tourist trip rather than a technical visit. We spent a lot of time looking at the incredibly ornate greenhouses, where they have examples of the plants they use as botanicals. There plants in the greenhouses aren't actually used in the gin though, so are strictly part of the tourist attraction. Fortunately the IBD mag had an article on Bombay Sapphire recently so I could look up the technical stuff afterwards. Bombay Sapphire has ten botanicals: juniper berries, lemon peel, coriander seeds, angelical roots, orsis root, grains of paradise, cubeb berries, cassia bark, almonds and liquorice. There are brand extensions that use some more botanicals, and we got to have a sniff of them all in an adjoining room. Based on what we liked best a cocktail was recommended for us, and I'm sure it will come as no surprise to my regular readers that modern epicurean was the one for me. This was all good fun but really I wanted technical details about the stills. I've long had a suspicion that gin distilling is quite frankly on the boring side. The do after all start with grain neutral spirit at 96.3% ABV so as far as I can see the interesting bit has already been done. It's to an 1830s design and has nine plates in the column, presumably from when spirits were less pure. The Grain Neutral Spirit (GNS) is diluted to 80% ABV before distillation, which helps ensure the still doesn't run dry, and the botanicals aren't boiled in the spirit, instead the vapour goes to in infuser which contains them. The distillation temperature is 79°C. Foreshots and feints aren't used and are sent off to be made into industrial alcohol. As they're starting with GNS this is because they don't contain the right concentration of flavouring rather than because of unwanted fusel oils. They made of big show of making the cocktails and I dare say they know their stuff but they're not really my thing. Had I not been driving and had there been more time it would have been interesting to work my way though their offerings though. As it is most gin that comes my way ends up as sloe gin and I don't think I'll be investing in a cocktail shaker any time soon. This year's SIBA conference started on a very low note for me. On arrival in Sheffield I found out the Ibis hotel I'd been booked into not only didn't do bacon for breakfast but didn't even have a kettle in the room. Surely this is against the Magna Carta? 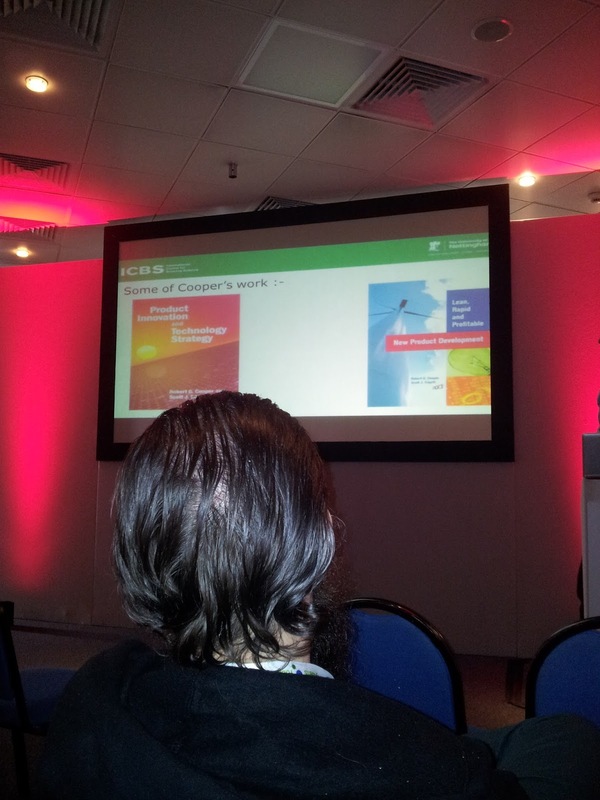 At the conference I only had to do one talk this year, based on the enquiries that come to the SIBA technical helpline. It seemed to go well and plenty of people came to talk to me afterwards or found us at our stall. I got to see Peter Darby of Wye Hops talk about the latest in hop breeding and I was able to get a few obscure vital hop questions answered. 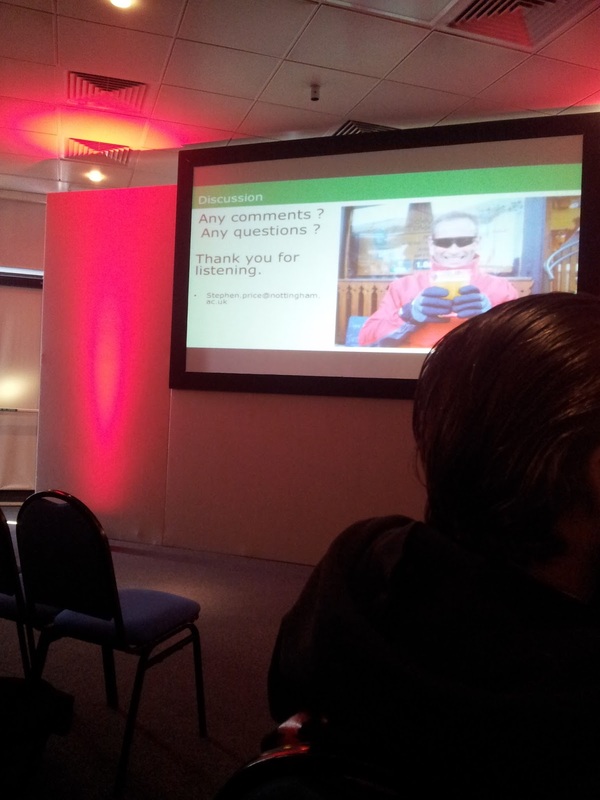 I also went to Steve Price's talk on New Product Development (NPD). Now an academic at an inferior Midlands based institution he spent many years working on NPD for large breweries. It was interesting stuff, but I can't help but think but think he's used to rather a different scale than his audience. He considers working on a brand which only sells 6,000 barrels a year to have been a failure, whereas I'm sure most brewers in the room would give their eye teeth for a brand that sells that much. I was quite restrained beerwise, which is just as well given the bacon situation, but did managed to get in a few pints of CPD. 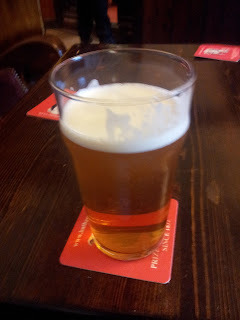 I revelled in the keggy glory and extraneous CO2-iness of Hardknott Azimuth. Though I did say an act of contrition and three Hail Protzes afterwards, you don't want to take chances with your immortal soul. 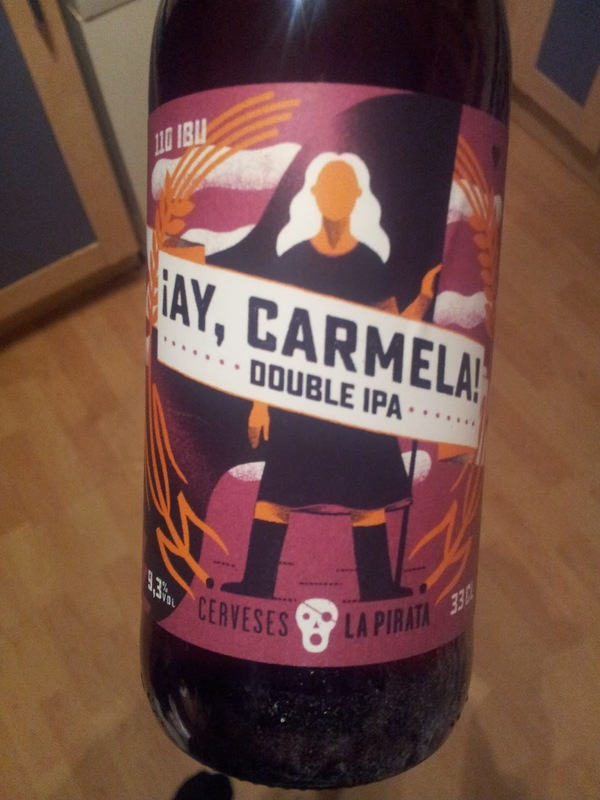 Sadly One Mile End didn't have any Rudolf Rocker available, but I was delighted to see that a Spanish brewery had one called ¡Ay, Carmela! so I had to buy a bottle. Still, they were missing a trick - if they'd had one called ¡A las Barricadas! I'd have bought a crate. Whilst I was busy researching on a field trip to Brighton my favourite brother-in-law was busy checking out the cutting edge of high tech beer geekery. "Basically, what happens is this. You choose what hop addition you want - there's a choice of three - and then your helpful bar person pulls out a vacuum sealed pack, opens it to reveal a sachet, which then gets slotted into the beer font contraption (a bit like some coffee machines). Then it starts up, with the base beer being dropped around the sachet, and mechanically spun around, I presume to infuse it, for 75 seconds. A half pint of beer is then dispensed. And what do you get? First thing you notice is 7 cm of foaming head: not good. The beer is fashionably cloudy. As for the taste... Well, in the name of thirst and inquisitiveness, I tried all 3 flavours. Positives - they did taste noticeably different, and the advertised "intensity ratings" were pretty spot on. But all of them - unsurprisingly - did seem to have a hop flavour that seemed unintegrated with the rest of the beer, something I've never had before. The African Sun Hop was the pick, with the advertised cedar wood aroma being pleasantly present. The 'base' beer is a pilsener and is apparently very nice on its own. Apparently these guys have invested a lot of money in this, but without wishing to diminish their chances of success, I can't see the point of this. Novelty? Yes. Better beer? Not really. You'd be better off necking some Thornbridge. Anyway, after I'd gone through the range, I then ordered a bottle of Chablis. Which kind of says it all." Old Dairy Brewery have won another national beer award, this time from SIBA. Dark Side of the Moo is now Small Pack Supreme Champion. They seem to have gone from strength to strength since I've left! Entirely due to the quality of my training I'm sure. I was Head Brewer when the beer was launched but it was really the baby of Will Neame, the man who succeeded me. It didn't seem right for me to have all the fun so I got the other brewers to design some of the beers. As it's made with dark malts and American hops, something I strongly suspect is an abomination unto the lord, it's to a beer I would never have made myself so I guess it's just as well I gave other people a go. 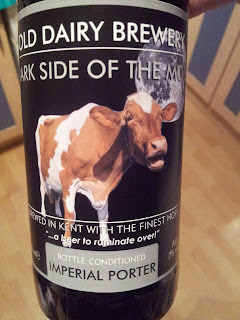 "Dark Side of the Moo started out as a variation of my original porter recipe. That original porter recipe had a very similar grist, was about 5% abv and was hopped with English Target and Fuggles and was a very pleasing drop of beer. Having tried Flying Dog's Gonzo Imperial Porter, I decided to modify my porter recipe in that direction to see what would happen. I didn't make it quite as strong but was almost as liberal with the American Cascade in dry hopping. This first iteration was named Dark Side of the Moon as it seemed pretty 'far out' to me, and a fitting name for a dark beer. When we first brewed it at Old Dairy we did so on the pilot plant and made enough for a cask to go to an Egham United Services Club Beer Festival. The only way to get the large amount of dry hops into the narrow necked home-brew barrel was to stuff in a carefully tied 'hop haggis'. When we eventually tried it on the full 5BBL plant I also added Chinook to the recipe as I thought a touch of the more piney, resiny notes would improve things. Of course the removal of the 'n' from moo perfectly adapted the name for Old Dairy Brewery." Will's now making botanical drinks for Old Tree but the current Head Brewer, Glenn Whatman, is clearly doing a great job producing the beers, and as he's now won a national CAMRA award and a national SIBA award in the space of a few weeks must surely be a shoo-in for Brewer of the Year. Last weekend I met up with some old colleagues for some research in Brighton. Coming the furthest, I of course got there first, whilst the person who actually lives in Brighton came in a respectable last. We started in the Evening Star. Despite the wide range of beers available I was determined to stick to Dark Star. It wasn't a bad decision as the Hop Head Dry was superb. Once we were all gathered and had had some light refreshment we went on to see Will's latest venture, Old Tree botanical drinks at Silo. There was all sorts of microbiological weirdness going on: kombucha, water kefir and a favourite microbiolgical miracle of mine: beer. I must bring a microscope next time I visit. The food was weird too, but very tasty. We then checked out the North Laine Brewhouse, where the beer was OK if unexciting. They had the rugby on so we didn't stay long. Next stop was...er...somewhere else. Nice pub, whichever one it was, and the Gun Brewery beer was good too. We were quite jolly by this point. As it was getting on we started making our way back to the station, though allowing time for another stop at the Evening Star.When it comes to research you can't be too thorough. Sometimes you have to take desperate measures. 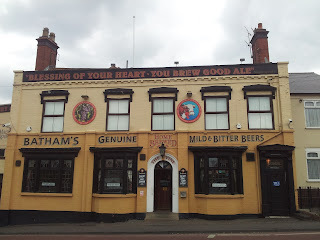 The fact I'd never had the much acclaimed Batham's Bitter was playing on my mind. There was only one thing for it. 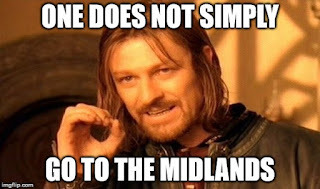 I would have to go to the Midlands. Being a cultural wasteland there's normally no reason to go there, so I'd never found a way of matching up finding the beer with doing something else. But it did occur to me that with a little side trip I could change the Midlands from the annoying bit when heading north to a welcome, and brief, break. So my next journey to the Lake District had a detour to Dudley planned into it. The satnav got me there without any bother and I was finally standing outide the famous Bull and Bladder pub. 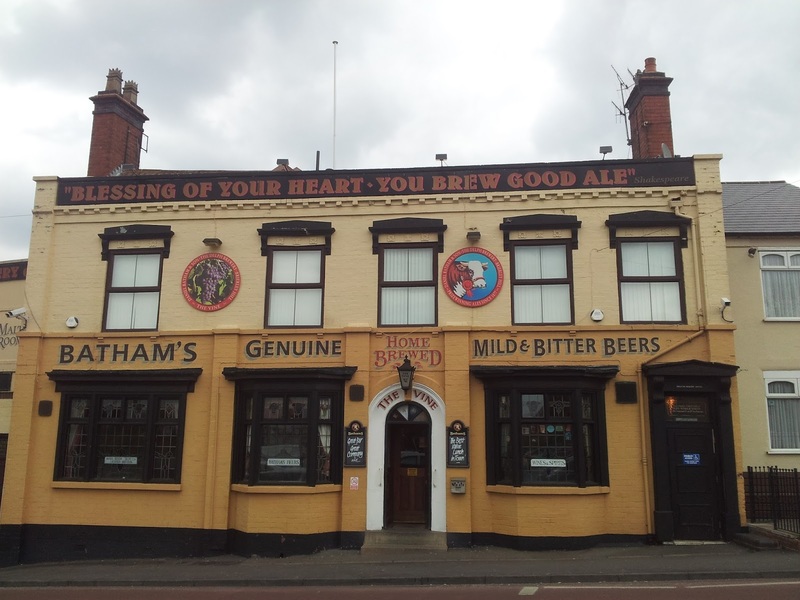 It's an excellent traditional boozer, with several rooms and two hand pumps on the bar: mild and bitter. Such elegant simplicity. And what a delight it is to be able to just say "a pint of bitter, please". Only £2.60 a pint too. As to the beer, I'm pleased to say it was good. Surprisingly bitter and surprisingly sweet there was also a little something adding something extra. A little four carbon molecule in fact: diacetyl. Now some would say that diacetyl has no place in beer. But they'd be wrong, in some beers it works. Admittedly it doesn't work in every beer, and in this one there was perhaps a touch too much, but I drank it quite happily and if I hadn't been driving I've had more. Sadly I was though, so with that I was off and heading north again. I get a slow trickle of invites to events through the blog. Many are at inconvenient times, like normal working hours; or inconvenient places, like another continent. But one recently looked altogether more appealing. 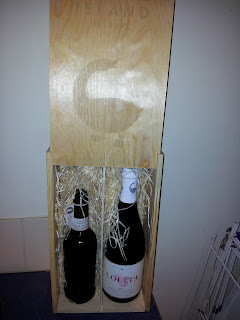 It was an invitation to a Goose Island event. I've long been a fan of their beers, right back to when I used to get bottles of Goose Island IPA from Safeways. To this day it remains a benchmark beer for me. I was also mightily impressed when I once found Bourbon County Stout on draught, so the fact some of that was on offer added to my interest. As did the fact I'd already booked the day off. Admittedly I was supposed to be in the Lake District by that point but sometimes a bit of flexibility is called for. The event was at the old Trumans brewery in London's East End, tying in with the 'Craft Beer Rising' festival. It's a big place so I was relieved when I spotted a handy banner saying 'pop up bar'. This must be it I thought, but it wasn't. It was for Pilsner Urquell (SAB Miller). The bar next door was for Guinness (Diageo), and the next one I found was for Sharps (Molson Coors). Truly craft beer is a multi-national, I mean global, phenomenon. I was on my second circuit of the place when my slavation came in an unexpected form: from The Tandleman himself. Is there anyone else you'd rather spot when lost and looking for a beer? * Sure enough, he'd soon got hold of the Goose Island (ABInBev) PR woman and we were being lead to the ligging. I started on the 312 Wheat Beer, though as was pointed out to me it's not made with a phenolic flavour producing yeast so is more a golden ale. It was pleasant enough, but no IPA so I was on to that next. It had been a while since I'd had a bottle as I don't buy much bottled beer nowadays. I was a little concerned as apparently it's changed since Goose Island's takeover and this is generally considered a bad thing. I believe it's now brewed in one of ABInBev's larger breweries and they had to make adjustments to brew it on the bigger kit. Of course if Goose Island were still independent and had contracted out the brewing this would be fine. In my unscientific tasting I thought it wasn't quite what it used to be, there seemed less hop zing. That didn't stop me drinking too much of the stuff mind. Food was laid on and we were meant to be doing that food and beer pairing thing but in my usual haste to shovel food into my gob I forgot all about it, so if you want to know what beers go with what foods you'll have to ask someone who cares.There were short talks from various Goose Island bods, but I can't really remember what they said. I seem to be having a bit of a beer nerd failure here. I do remember the place had a barrel theme going on though. ABInBev are now distributing Goose Island beers in Britain directly and Bourbon County Stout will be coming our way. Towards the end of the night we got ushered into a darkened room for an audience with the Goose Island Innovation Brewer. I think this was part of the cult of personality thing that craft breweries like to build around their brewers. Still, he seemed a nice chap, and we got given more beer and some posh chocolates, as well as some goodies to take away. The Bourbon Country Stout is great stuff, though the general feeling was the normal version is better than the rarer aged in old barrels version as that had too much of a whiskey taste. * The Tandleman has gained legendary status amongst beer bloggers. I'm not entirely certain why but I'm not going to let that stop me joining in. 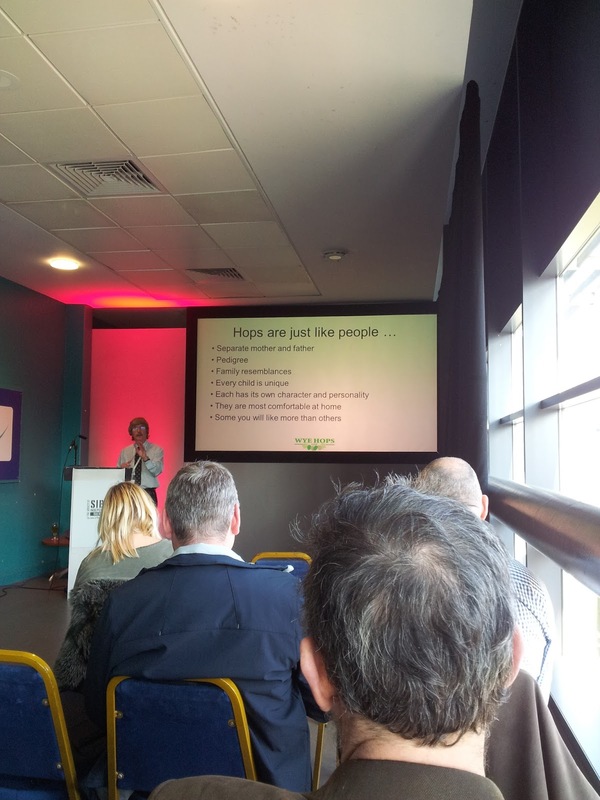 I was at an IBD event at Arkell's brewery the other week. We were there for a tasting of milds, porters and stouts. The ABV ranged from about 3.5% to 10.5% so it's a shame I was driving really. A small sip of the beer and then chucking the rest away seemed a touch blasphemous. I did get to take lots of pictures though, and it's a wonderful old brewery. I don't think there's any mythical story about Arkell's steam beer so I guess it was called a steam brewery because it was steam powered and they were proud of their cutting edge technology. The brewers talked about their beers but I'd forgotten my notebook so no scribbled details I'm afraid, though I do remember that Fuggles featured in a lot of the beers. As it's a very traditional ingredient I'm sure it will appeal to the craft beer fans. In the discussion there was some waxing lyrical about the wonders of Styrian goldings though, something about which I entirely concur. We also got to go on a tour, led by Alex Arkell. The valentine arm caused some excitement, though I'm not convinced about them myself. The mash tun still had cogs from when it was fitted with arms. In the days before sparging the grist would be mashed several times and needed mixing. The mill is no doubt an antique. Every family brewery seems to have a hundred year old mill. There was quite a range of fermenting vessels of different vintages. The cask filler was new though. The bottling line was modern too. At one point Arkell's did a lot of bottling, then it stopped completely, and now it's started again and is growing. It'll be cans and keykegs next, you mark my words.